Minus 50 is a highly efficient blend of R290 and R170, propane and ethane. When switching from R22, R502, R407C, and R404A power bills can be dramatically reduced, and the wear and tear on the air conditioning system can also be minimised. 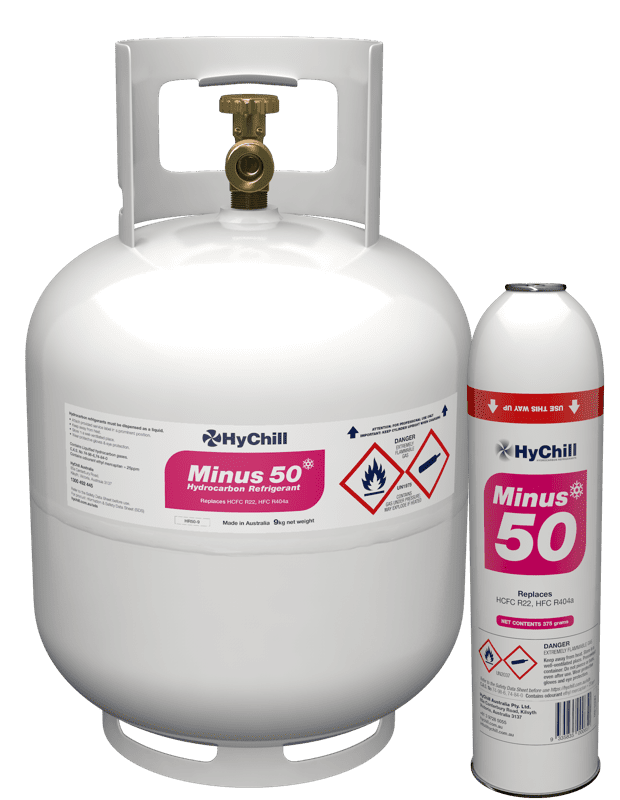 HyChill Minus 50 is the Natural Organic solution for low temperature refrigeration and air-conditioning systems previously charged with HCFC R22 or CFC R502. An air conditioner or refrigeration system charged with Minus 50 uses up to 20% less power than HCFC-based refrigerants. Because hydrocarbon refrigerant is more efficient, it can cool a room down to the temperature set by the thermostat in less time. In hot weather, this can result in substantial energy savings. Can be used in a R22 or R407C compressor. For use in commercial and industrial refrigeration and air-conditioning systems where R22 has traditionally been used.